As the head of Sudbeat Music and the guru of the emerging South American house music scene, Hernan Cattaneo has become a renowned DJ back when he released a mix on the classic Renaissance Masters mix series in 2004 alongside legends John Digweed and Sasha as well as having a place for a decade on DJ Magazine’s Top 100 poll. Aside from spinning at acclaimed nightclubs in Europe, Cattaneo has also seen himself behind the decks at international festivals performing for massive crowds. Nick Warren, whose reputation as a DJ and A&R frontman for Hope Recording has made him a staple in the house music scene. 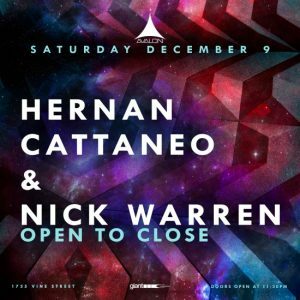 Playing across the globe at extravagant night clubs almost every weekend and being the second half of acclaimed duo Way Out West, Warren is one of the hardest working and genre-defining producers in the game. His latest collaboration track with Israeli producer Guy Mantzur titled “Sad Robot” has received airplay and critical support from BBC6 and reached no. 4 on Beatport Techno chart.